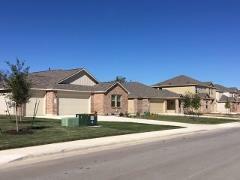 The current Active MLS listings of Homes for Sale in Cool Springs in Kyle, TX are shown below. For more information or a showing, call Jim at 512.913.1557. Note: Since this is a new construction neighborhood, the listings may not map correctly. Location: From Austin, drive IH-35 south to the FM-150 exit (#213). Turn left across the freeway and follow FM-150 for about 2 1/2 miles. The neighborhood is located across from the Waterleaf subdivision and New Bridge RD. 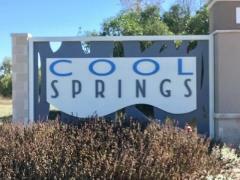 There are two entrances to Cool Springs--at Mineral Springs DR and at Cool Springs DR. The temporary sales office is located on Mineral Springs DR on the left past the entrance. The table below will be updated yearly with stats from the Cool Springs market. COOL SPRINGS KYLE real estate market data from the Austin Board of Realtors, 1/1/18 - 12/31/18. 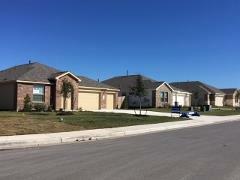 This new subdivision in Kyle 78640 is still in its early stages. The neighborhood infrastructure for its initial section of homes is in place. There are a number of completed residences, and many more to to come. The builder (Lennar Homes) has several active for-sale listings in the Austin-area MLS. 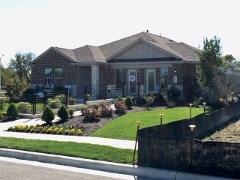 The model home has been completed and is open for sales. The kitchen of the model is shown in the photo. Phases 1 and 2 of this 126-acre development will provide a total of 372 residences. Phase 1 will have 99 homesites. There are plans for a future amenity center. In addition, the builder has set aside an area as parkland/greenbelt. 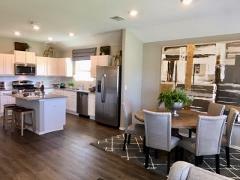 In December 2018, the base prices for these Lennar Highland Collection homes range from $243,990 to $303,990. The nine (9) plan options include six single-story homes and three two-story plans. These homes will feature 3-4 bedrooms, 2-2.5 baths, 2-car garages, and air-conditioned living space from 1,491 to 3,031 sq. ft.
Lennar's "Everything's Included" homes are slated to be energy efficient (16-SEER HVAC, radiant barrier roof decking, Low-E insulated vinyl windows, e.g. ), and will be include many standard features like 2-inch faux-wood blinds, brushed-nickel door and main-living hardware/fixtures, SS appliances and granite countertops w/undermount sink in the kitchen. They are residences are designed for modern living, with the inclusion of many "Connected Home" smart-home features. Home buyers will find Ethernet and wireless access points, Amazon Echo Show and Echo Dot devices, a smart front-door lock, a Ring video doorbell, a Lyric Wi-Fi thermostat and more! Membership in the Cool Springs HOA (homeowners association) will be required. Fees (initially set at $500 annually) cover the upkeep of the neighborhood common areas and the future amenity center. The taxes are levied by several entities, including the City of Kyle, Hays County, and the Hays Consolidated ISD. The property values are set by the Hays Central Appraisal District (HCAD). Utilities are provided by PEC (electricity, Pedernales Electric Cooperative), Centerpoint (natural gas), County Line (water service), and the City of Kyle (trash and wastewater). Internet service comes through Charter (Spectrum, formerly Time Warner). Shopping and eating options in the Kyle area include these major developments along IH-35: Kyle Crossing, The Village at Kyle, Kyle Marketplace. They host big box stores like HEB Plus, Target, WalMart SuperCenter, Ross and Lowe's, and many smaller business and eateries. The Kyle Town Center (just to the north toward Austin on IH-35) features a Home Depot, Evo Theater (entertainment venue) and a convenience store. To the north of Kyle in Buda (Cabela's outdoor store, WalMart and HEB). Head north to Austin for many other options (Southpark Meadows development, for example). South to San Marcos leads to the Tanger Outlets & Premium Outlets, e.g. New Braunfels and San Antonio provide many other shopping, eating and entertainment choices. Medical Care: There are a number of local walk-in and emergency-type medical-care facilities in the Kyle area. The largest medical provider in the Kyle area is the Seton Medical Center Hays (opened in 2009). Travel: IH-35 is the main artery for going north and south from Cool Springs, with access via FM-150. ABIA (Austin Bergstrom International Airport) is northeast of Cool Springs. Take IH-35 to US-71/290, and travel east to the airport, or get on SH-45 just north of Buda to SH-130 north, then go east on US-71/290 to ABIA. Golf: Kyle's Plum Creek Golf Course is the closest course for Cool Springs golfers. Many other golf options are available in Austin and in the surrounding area. Students in the Cool Springs neighborhood will attend schools operated by the Hays Consolidated Independent School District (HCISD). The assigned schools for Cool Springs students in October 2017 are Tobias Elementary, Simon Middle and Lehman High. Since school attendance boundaries are sometimes redrawn, parents and prospective homeowners are encouraged to verify current school assignments with the Hays CISD.